A 30-second television spot concerning Kazakhstan’s peace keeping efforts and the Nazarbayev Prize for a Nuclear Weapon Free World and Global Security was produced recently. To watch the spot, click here. 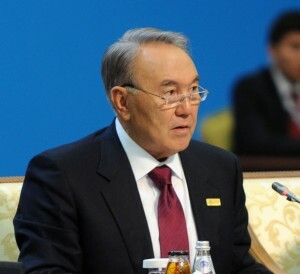 a new prize, the Nazarbayev Prize for a Nuclear Weapon Free World and Global Security. In November 2017 in Astana, the first such award was given to King Abdullah II of Jordan. Kazakhstan has been a decades-long internationally recognised leader in the global antinuclear weapons movement. Their efforts, after more than 450 Soviet nuclear weapon tests were conducted at the Soviet Union’s nuclear test site in Semipalatinsk in eastern Kazakhstan from 1949 to 1991, have begun with the closure of this test site in 1991 and continued with the elimination of what was then the world’s fourth largest nuclear arsenal. The period of testing has inflicted great suffering on the Kazakh people and environment. Tests negatively affected the health of more than 1.5 million Kazakh citizens including many who, to this day, in the first and the second generations, suffer early death, lifelong debilitating illness and horrific birth defects. In presenting the award, President Nazarbayev specifically highlighted Jordan’s acceptance of up to 1.3 million refugees since the Syrian crisis began more than six years ago, as well as Amman’s involvement in the Astana Process peace talks on Syria as an observer. Jordan’s contribution to peace process between Israel and Palestine was also noted as was the king’s work to make the Middle East a nuclear weapons-free zone. At the ceremony at the Akorda presidential residence in Astana, the king stressed that “this award is for the entire people of Jordan” and said any prize funds related to the award will support Jordanian students in public schools.